Headboard: Mod. 3K2745 King CM w 212 d 6 h 147 cm IN w 83 1/2" d 2 1/4" h 57 3/4" Mod. 3Q2746 Queen CM w 171 d 6 h 147 cm IN w 67 1/4" d 2 1/4" h 57 3/4"
Soft-touch upholstered double bed. 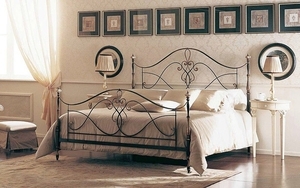 Shaped upholstered headboard, with a round and sinuous design. Soft-touch upholstered double bed with capitonnè manufacture and matching buttons, both on the headboard and on the low footboard. Soft-touch upholstered semi-double bed. The headboard has an elegant, sinous design. Bed with headboard and padded sides MFG33 / MFS43. Bed with plywood and solid wood structure. Polyurethane foam and polyester fiber lining. Non-removable cover. Gros grain piping. Solid ash wood legs with satin brass ferrules. Wooden slatted base included. Mattress not included. GARNIER A unique canopy bed with signature mahogany Christopher Guy scroll detail arms. Available as a bed or freestanding headboard. Ruffle A highly dramatic flourish of exquisitely hand-carved mahogany in a ruffle design. Also available as headboard. The rule of design Revamping a classic is the purpose of this new Volpi contemporary collection. A retro-inspired design, the use of walnut or ash solid wood and craftsmanship are the key elements of this project. Couture materials to dress up your home New fabrics with precious texture, used either structurally or decoratively with design solutions embodying the idea of modern aesthetics. Bed with curvilinear profiles. The size of the mattress and of the bed base suitable for this bed is 160×200 cm. It’s possible to reduce or increase the dimension of the spar on request. A traditional bed is characterized by symmetrical, curvilinear shapes, usually fashioned from dark wood, with a glossy finish and finely crafted decoration. ArchiExpo offers a wide range of models categorized by specific type, including single, double, loft, canopy, round, folding and trundle. Elegant aesthetics make these beds a frequent choice for homes and hotel rooms. While solid wood is the most commonly used material, finely worked wrought iron with decoration similar to that of wood also is used. Some beds include practical features such as storage in the base, integrated shelves and night stands, among others. Choice will depend primarily on bed size and available space, especially in the case of a double or canopy bed. Where space is limited, integrated shelves or other storage should be considered.